A Taste of Italy at the Pearl! Name: A Taste of Italy at the Pearl! 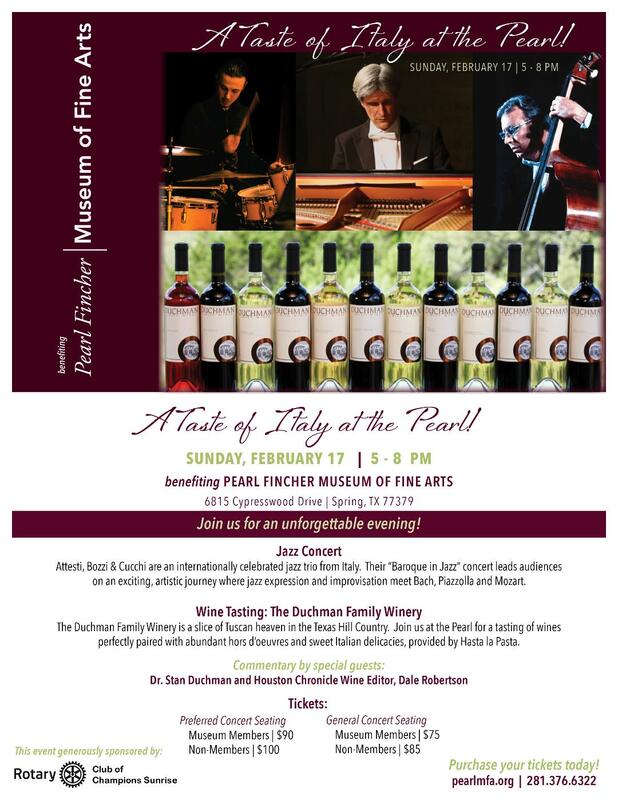 An internationally acclaimed jazz trio and world-class wine from the Texas Hill Country will come together in one unforgettable evening to benefit the Pearl Fincher Museum of Fine Arts. The evening begins with a wine tasting, featuring award-winning wines from the Duchman Family Winery. Wines will be perfectly paired with hors d’oeuvres and sweet Italian delicacies, provided by Hasta la Pasta. Dr. Stan Duchman and Houston Chronicle Wine Editor, Dale Robertson, are scheduled to appear at the event to offer commentary and conversation with guests. Along with great wine and food, the event features a concert by the A B & C Jazz Trio—Attesti, Bozzi & Cucchi—who are on tour from Italy. The event is generously sponsored by Rotary Club of Champions Sunrise, to benefit the Pearl Fincher Museum of Fine Arts. Tickets with preferred seating for the concert are $90 for museum members or $100 for non-members. General seating tickets are $75 for museum members or $85 for non-members.